The exterior of this imposing building features vertical brise-solieil in translucent glass. 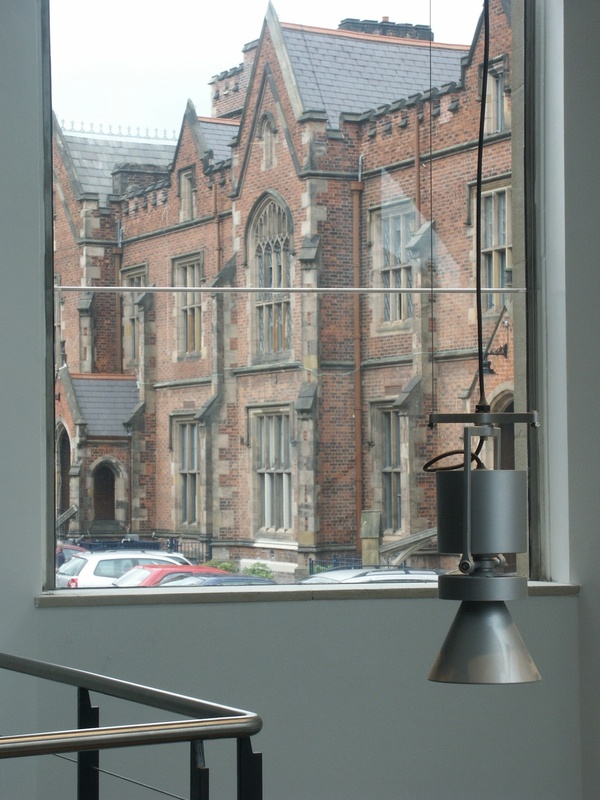 This was the inspiration for the bespoke internally illuminated fins suspended in the interior atrium. The exterior brise-soleil is illuminated by ground mounted iGuzzini iPro spots, throwing a strong narrow light controlled by linear fresnel lens accessories. Echoing the coloured brise-soleil outside, these internally illuminated fins create a striking effect in the atrium, using daylight as effectively as their own LEDs. We adapted a linear LED system to confirm to the angles of the pre-cast staircase. Accurate measurements were needed on site and great care was taken to minimise the installation work. One of many meeting spaces, each with it's own character, the circular pendants enhance rather than detract from the ceiling moulding details. Wishing to avoid the blight of the bland opal modular LED luminaires in this area, we designed an 'L' shape luminaire that is as convenient to install and creates an attractive random pattern in the circulation areas. Another space with it's own identity, the garden room has the feeling of an external verandah space. 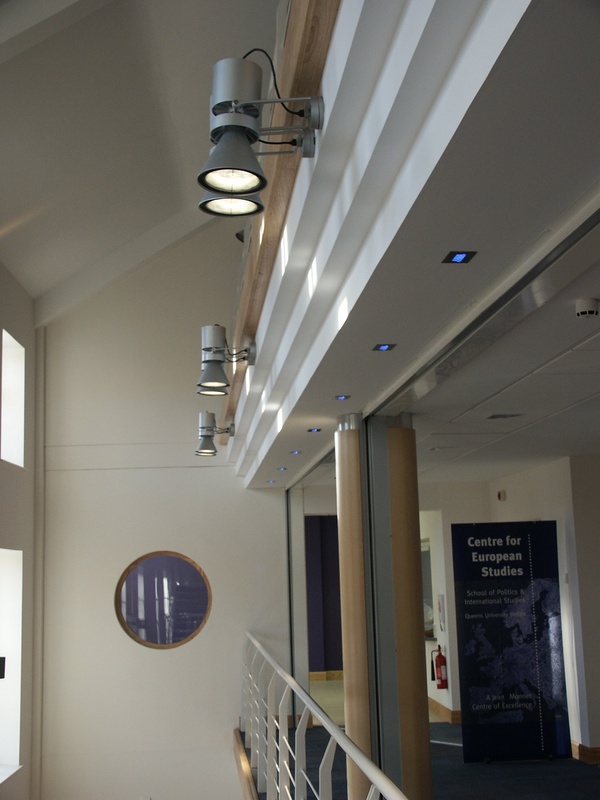 Bernard Crossland in above all, a teaching facility and the lighting for the teaching spaces was designed for maximum efficacy, enhanced flexibility and of course minimum glare. Some of the teaching spaces have a more eclectic character. 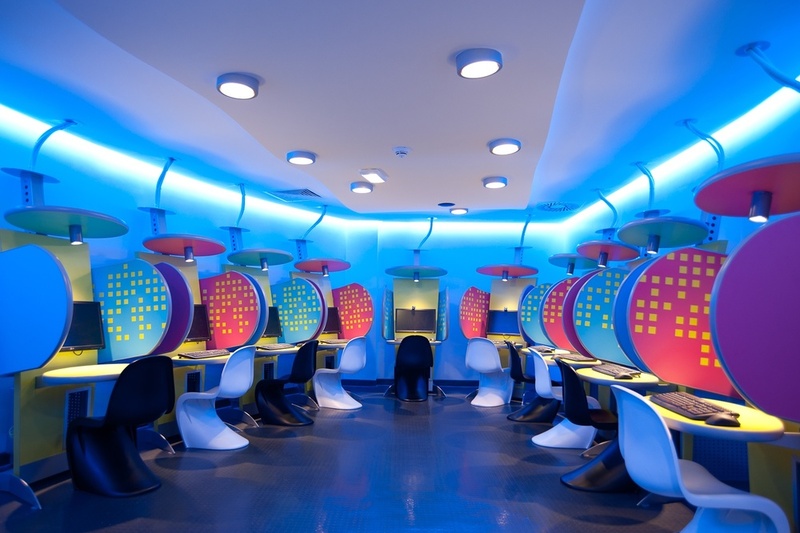 Many of the meeting/breakout spaces have their own individual character. Features such as this bespoke pendant from Exenia create visual interest. This new purpose built facility is great example of cutting edge design retaining a sympathy with some of Ireland's most respected and well loved traditional architecture. 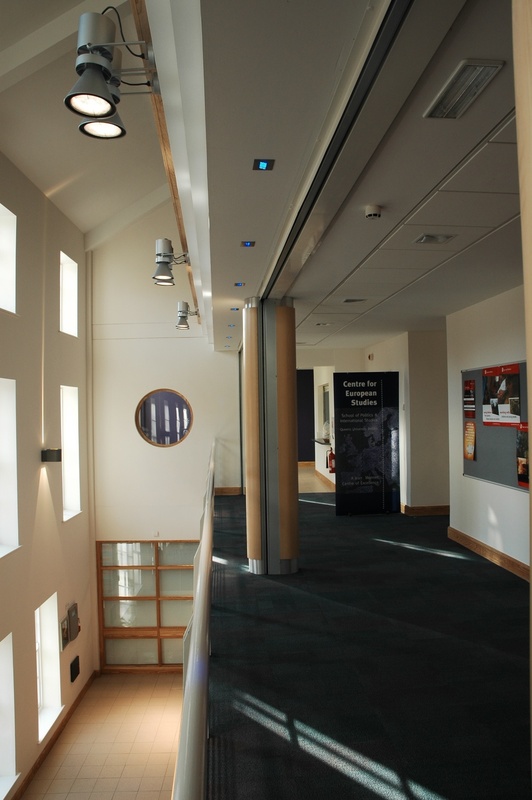 The stairwell features continuous LED channel integrated seamlessly into the steelwork. Wire suspended continuous lighting from LAMP forms a dramatic facet of this lecture space.